Just a quick cross post from my college Robert Bird original posting here. Be aware that when upgrading to SCOM 1801 in order to upgrade reporting successfully you need to install the SCOM console onto the SSRS instance first otherwise the upgrade will fail. This entry was posted in SCOM 1801, SCOM 2012 R2, SCOM 2016, Troubleshooting, XPost and tagged #1801, #2012 R2, #2016, #SCOM, #Troubleshooting on February 23, 2018 by Warren Kahn. The report server cannot decrypt the symmetric key used to access sensitive or encrypted data in a report server database. You must either restore a backup key or delete all encrypted content. Luckily my customer had a recent backup of the SSRS key and it was a simple matter to restore the key and restore SCOM reporting functionality. You may be asking “How do I backup my SSRS encryption key?” no worries it is a simple procedure, I recommend making this process part of a monthly set of tasks. Restoring the key is similar you just select Restore from the same page and locate the key file and provide the password. This entry was posted in SCOM 2016, SCOM Basics, Troubleshooting and tagged #2016, #Basics, #SCOM, #Troubleshooting on January 4, 2018 by Warren Kahn. When trying to install a second management server in a SCOM 2016 management group, after entering the OpsDB details, a few moments later the wizard would return to the SQL details screen. Info:Error while connecting to management server: The client has been disconnected from the server. Please call ManagementGroup.Reconnect() to reestablish the connection. Error: :Couldn’t connect to mgt server stack: : Threw Exception.Type: Microsoft.EnterpriseManagement.Common.ServerDisconnectedException, Exception Error Code: 0x80131500, Exception.Message: The client has been disconnected from the server. Please call ManagementGroup.Reconnect() to reestablish the connection. First confirming that the Data Access service was in fact running on the original management server and that a connection could be made to the SDK. It turns out that the two servers times were out of sync by more than 5 minutes causing a Keberos time skew. After correcting the server time the second management server installed with no issues. This entry was posted in SCOM 2012 R2, SCOM 2016, Troubleshooting and tagged #2012 R2, #2016, #SCOM, #Troubleshooting on August 15, 2017 by Warren Kahn. There is an issue with the October cumulative updates (KB3194798, KB3192392, KB3185330 & KB3185331) for all windows versions which is causing the SCOM console to crash. Thank you to Dirk Brinkman for blogging about this issue. The Product Group is aware of this issue and is working on a fix. Unfortunately I do not have an ETA for it. You will find an announcement on the SCOM Team blog (https://blogs.technet.microsoft.com/momteam/) once the fix for this issue is availabe. All credits and thank’s to my colleague Mihai Sarbulescu for finding this issue! Update from Dirk Brinkman The product group released a hotfix for this issue: https://support.microsoft.com/en-us/kb/3200006. This entry was posted in SCOM 2012 R2, SCOM 2016, Troubleshooting and tagged #2012 R2, #2016, #SCOM, #Troubleshooting on October 18, 2016 by Warren Kahn. Microsoft has finally officially recommended a workaround that some of us have been using for some time to keep the SQL dashboards in a usable state. Issue: When used rarely or after a long break, the dashboards may work rather slowly due to large amounts of the collected data to be processed; especially, it is related to large environments (2000+ objects). Resolution: Below is a “warming up” script, which may be used to create an SQL job to run on some schedule. Before scheduling it as an SQL job, please test how long these queries will be executing (if you will schedule it to run too often or execution time is too long, that may kill the performance). If you have dashboards with thousands of objects to load, then time to load the content will be 10+ seconds anyway. It was tested with 600 000 objects, and the dashboard loading time was 1-2 minutes. This entry was posted in #SQL, Management Pack, SCOM 2012, SCOM 2012 R2, Troubleshooting and tagged #2012, #2012 R2, #Management Pack, #SQL, #Troubleshooting on March 11, 2016 by Warren Kahn. XPost: Warning Base OS MP version 6.0.7303.0!!! 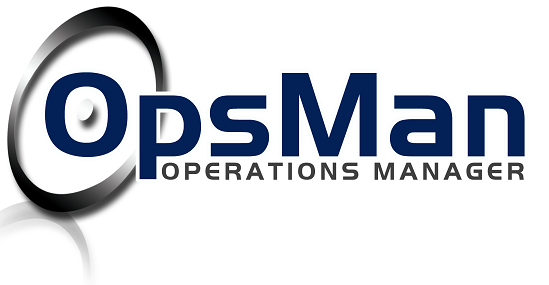 ***WARNING*** There are some significant issues in this release of the Base OS MP, I do not recommend applying this one until an updated version comes out. Cluster Disks on Server 2008R2 clusters are no longer discovered as cluster disks. Cluster Disks on Server 2008 clusters are not discovered as logical disks. Quorum (or small size) disks on clusters that ARE discovered as Cluster disks, do not monitor for free space correctly. Cluster shared volumes are discovered twice, once as a Cluster Shared Volume instance, and once as a Logical disk instance, with the latter likely cause by enabling mounted disk discovery. So best to hold off on this one folks. This of course comes back to some big questions about MP quality control as we’ve had many issues with the recent SQL MP releases and now this. This entry was posted in Management Pack, Troubleshooting, XPost and tagged #Management Pack, #Troubleshooting, #XPost on March 1, 2016 by Warren Kahn. A while ago I had a request from one of my clients to monitor their new Fortigate Firewalls, as there is no existing management pack for this it required a bit of custom work. First on the firewall you’ll also need to configure SNMP, as well as what trap notifications will be sent. 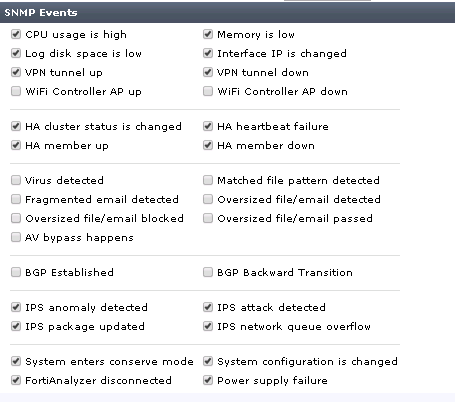 Then discover the Fortigate using the standard network monitoring discovery. This is the address for the Fortigate MIB file contents which you will need in order to map OIDs for the next part. 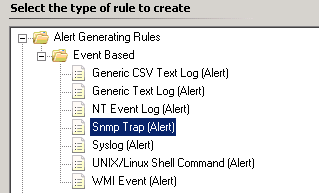 In SCOM create an SNMP Trap alerting Rule targeting the Node Class. This rule will be used to identify any OIDs in the future that may be missing from your specific alerting rules. 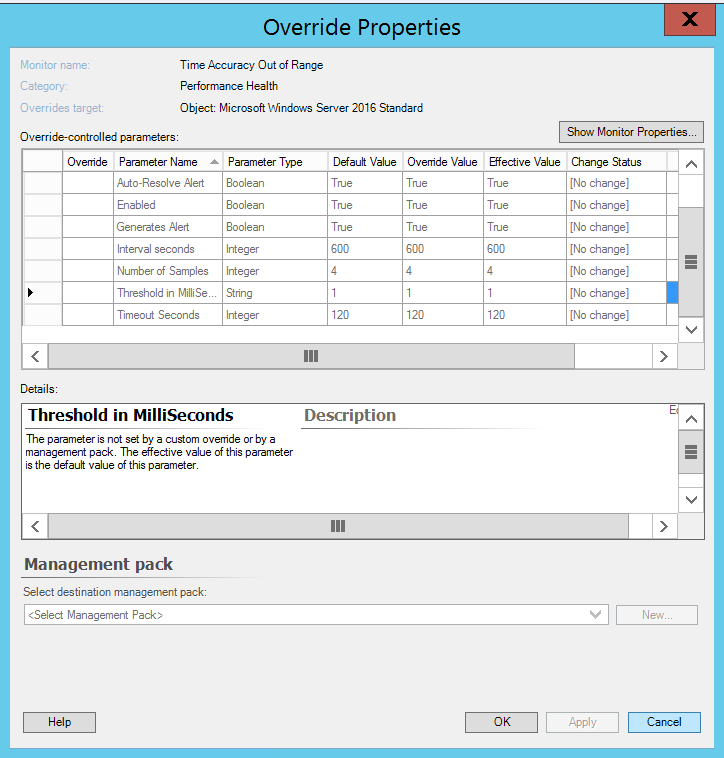 Now using the MIB list provided earlier each alert ticked in the Fortigate configuration needs to be mapped to the relevant OID and a specific alerting rule created for it, for example 1.3.6.1.4.1.12356.101.4.4.2.1.2 is the OID for HIgh Processor Usage. 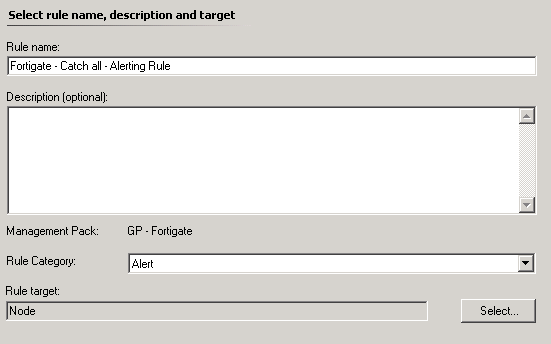 So in order to generate an alert for High CPU on the Fortigate you will need a rule with this specific OID in the filter 1.3.6.1.4.1.12356.101.4.4.2.1.2. Repeat for each OID that you need to monitor and use the catch all to identify anything you may have missed. This entry was posted in SCOM 2012, SCOM 2012 R2, Troubleshooting and tagged #2012, #2012 R2, #SCOM, #Troubleshooting on February 29, 2016 by Warren Kahn. Here is a great post by Kevin Holman addressing an issue you would come across if you have had to move your SCOM databases or recover them to a new SQL server. Error 777980007, severity 16, state 1 was raised, but no message with that error number was found in sys.messages. If error is larger than 50000, make sure the user-defined message is added using sp_addmessage. In essence this happens, as explain, due to the sysmessages being created in the master database on installation. These messages will then be missing after a database move or new sql server recovery. This entry was posted in SCOM 2012 R2, Troubleshooting and tagged #2012 R2, #SCOM, #Troubleshooting on February 11, 2016 by Warren Kahn.